Golden Palms is a luxury villa of the highest quality in Orlando, Florida. The villa is well appointed with fine furniture and fully air conditioned with additional ceiling fans through out. With a large South facing pool and spa Golden Palms is the perfect holiday home. Located in the stunning surroundings of Emerald Island Resort this villa has uninterrupted views over a beautiful lake and woodland conservation area. The Emerald Island Resort is one of the closest to Disney World, yet secluded enough to enjoy quiet evenings and spectacular Floridian sunsets. Featuring 7 en suite bedrooms the villa can accommodate up to 16 people for the holiday of a lifetime. Recently upgraded with a brand new top of the range entertainment system, the family lounge is an ideal place to enjoy TV programs in HD, movies on the blu-ray player, listen to music on the superior sound system or to simply relax with friends and family. Upstairs there is an entertainment lounge that is a movie lover and video gamer’s paradise. With a 64” TV, DVD player, XBOX 360 and reclining sofas you can immerse yourself in your favourite films and games. Alternatively, the upstairs entertainment lounge is the perfect place to enjoy some quiet time with a book. Golden Palms boasts a large South facing heated pool and spa. Guests can enjoy cooling off and relaxing in the pool while enjoying the uninterrupted views of a beautiful lake and woodland conservation area. With lots of sun loungers, seats and tables you can soak up the Floridian sunshine on the large pool deck that is not overlooked by another villa. Should you want to cool off and still enjoy the stunning scenery you can rest under the large lanai with ceiling fans. A high spec BBQ and a large outdoor dining table sets the scene for you to enjoy sizzling steaks in the tranquillity of the lake view. For peace of mind for those travelling with young children there is a pool safety fence and alarm on the patio door. 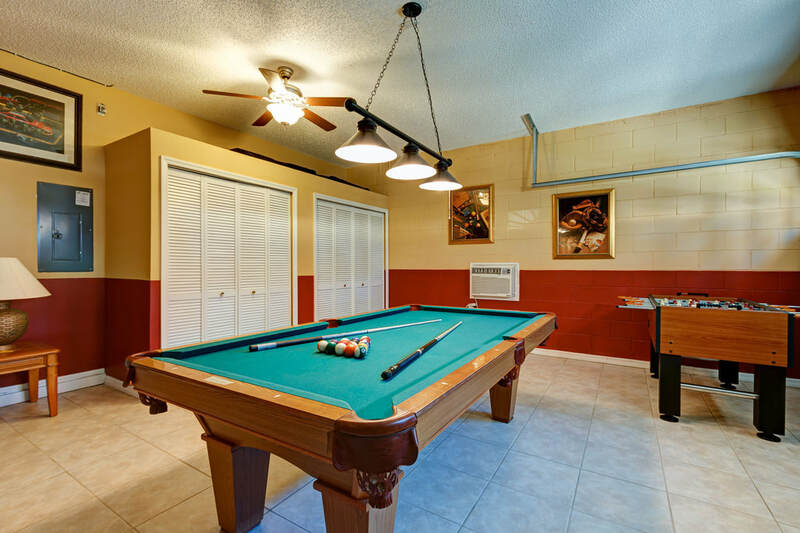 With a top of the range slate bed pool table, foosball and TV in the games room hours of fun are to be had by both adults and children of all ages. There are 7 en suite bedrooms in Golden Palms, all are furnished to the highest standard and tastefully styled. There are 2 king size master bedrooms, 2 queen size bedrooms, 1 twin bedroom and 2 bunk bed rooms. Every bedroom features TV’s with cable TV and DVD players, built in wardrobes and en suite bathrooms. There are 5.5 bathrooms in total; all are supplied with fresh towels and soaps upon your arrival. All of the bathrooms feature hairdryers. Golden Palms boasts a kitchen with all the amenities one could want and is fully stocked with all cutlery, cups, plates, pots and pans. There is a large fridge freezer with an ice dispenser and a top of the range coffee percolator. You can prepare quick snacks or mouth watering meals with ease with the large counter tops and island. The open plan kitchen also features a breakfast table that looks out upon the conservation area and provides the perfect way to start the day while enjoying the sun rise. Upon your arrival a free grocery starter pack is provided so you can relax after your journey and begin your holiday of a lifetime immediately. An inviting reception lounge provides further space to relax and leads onto the dining area that features exquisite furniture. You can enjoy meals in style and comfort should you choose not to dine at one of the many local restaurants. Golden Palms features free wireless internet and free local and national phone calls ensuring you can keep in touch with friends and family or conduct business during your stay. A washing machine, dryer, ironing board and iron are provided in the utility room. 2 travel cots, 2 buggies and 2 high chairs, a baby bouncer and a baby monitor are provided free of charge.